(MOSCOW) — Russia challenged U.S. compliance with a key nuclear arms control treaty Monday and warned that the Trump administration’s new nuclear strategy lowers the threshold for using atomic weapons. The dire assessment came as Moscow said it has met its own requirements under the New START agreement that was signed in 2010 and entered into force a year later. It restricts both the U.S. and Russia to 1,550 deployed strategic nuclear warheads on a maximum of 700 deployed intercontinental ballistic missiles and strategic bombers. The deadline to verify both countries’ compliance was Monday. 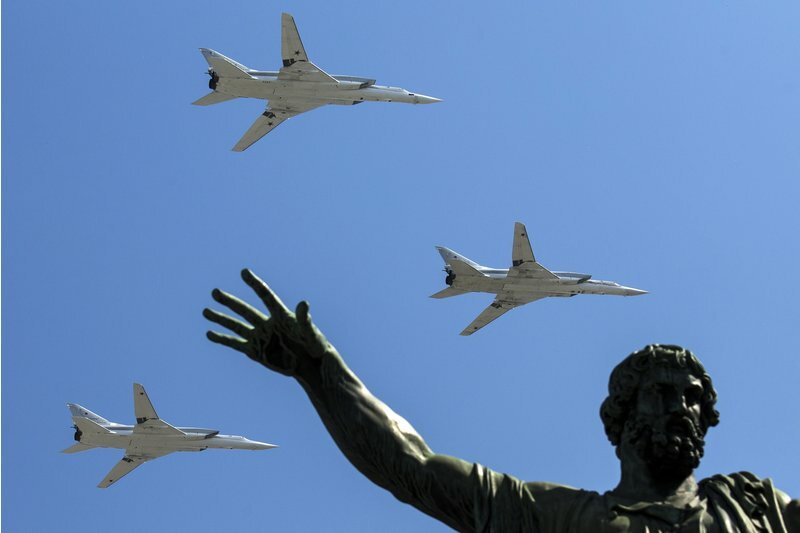 The Russian Foreign Ministry said it now has 527 deployed intercontinental ballistic missiles and strategic bombers. It gave a tally of 1,444 strategic nuclear warheads. The U.S. reported it has been in compliance with the limits since August. Russia acknowledged the U.S. position on meeting the targets, but voiced concern about the U.S. reconfiguring some submarines and bombers to carry conventional weapons. The Foreign Ministry said it doesn’t have a way to confirm the reconfigured hardware was rendered incapable of carrying nuclear weapons. Washington also “arbitrarily converted” some underground missile launch sites into training facilities, which wasn’t spelled out in the treaty, the ministry said. It urged the U.S. work with Russia to resolve such matters. The U.S. State Department insisted America was fully adhering to the deal. Russia-U.S. ties have been miserable for several years, but nuclear weapons reduction has been a strong point. The former Cold War foes have clashed most notably over Russia’s conduct in Ukraine, the Syrian civil war and allegations Moscow meddled in the 2016 U.S. presidential election. The Trump administration’s pivot to a new nuclear strategy could now affect arms control cooperation. Last week, the Trump administration announced it would continue much of President Barack Obama’s nuclear policy, while adopting a more aggressive stance toward Russia. Russia must be convinced it would face “unacceptably dire costs” for threatening even a limited nuclear attack in Europe, the new policy states. On a more positive note, U.N. Secretary-General Antonio Guterres congratulated the U.S. and Russia on successfully reducing their strategic nuclear forces to the required level and urged both countries to engage in further arms reductions, U.N. spokesman Stephane Dujarric said. “The secretary-general stresses that at a time when global anxieties about nuclear weapons are higher than at any time since the Cold War, efforts in nuclear disarmament, nonproliferation and arms control are more vital than ever,” he said. The Pentagon-led review made clear the administration’s view that Russian policies and actions are fraught with potential for miscalculation that could lead to an uncontrolled escalation of conflict in Europe. It specifically pointed to a Russian doctrine known as “escalate to de-escalate,” in which Moscow would use or threaten to use smaller-yield nuclear weapons in a limited, conventional conflict in Europe to compel the U.S. and NATO to back down. Consequently, the review said the U.S. would modify “a small number” of existing long-range ballistic missiles carried by Trident strategic submarines to fit them with smaller-yield nuclear warheads. Russia slammed the U.S. report, saying it was founded on false assumptions about Moscow’s intentions and contained worrying modernization plans. The ministry said Russia’s military doctrine envisages the use of nuclear weapons to deter an aggression that threatens “the very existence of our state.” It said Washington, however, took a no-limits approach that could mean using nuclear weapons in “extreme circumstances” beyond defense against military operations. “Even military scenarios are presented so ambiguously that it seems like the U.S. planners may view practically any use of military capability as a reason for delivering a nuclear strike against anyone they consider an ‘aggressor,'” the ministry said. “Assurances that the implementation of these plans will not lower the nuclear threshold can at least be interpreted as a desire to delude the international community,” the ministry said. 0 Response to "Russia Questions U.S. Compliance With a Key Nuclear Arms Control Treaty"